The kids weren't feeling very well yesterday afternoon when they got up from their naps. 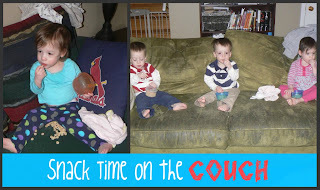 Elijah and Caleb had been running a fever the day before, and Abby and both boys were fighting runny noses. I decided to let them have their snack in the living room with a movie since they really didn't want to do anything but sit there. They did fabulously! I was so proud of the minimal mess that I might just be convinced to let them enjoy a snack in the living room again. Turns out the fevers and runny noses were only a preview of what was to come. The Elijah and Ellie synchronized their puking last night (such good little buddies), and Abby joined the ranks this morning. The stomach flu has hit our house again...and it's only been a month since the last time we had it! At least the upside is that the kids got to sit on a fancy covered couch. Caleb thought it was really fascinating that I would drape a sheet over it and kept trying to pull it off. By lunch it was wadded up on the floor. At least no one threw up while sitting there though! I completely overhauled my open pantry, and it looks so much better now! It took several hours over a couple of days to work through all of it, but it's done. Whew! It's been on my to-do list forever. I'd put a photo up today, but something this massive deserves it's own post. Come back Sunday for that one!